Slice off the ends of the unpeeled cucumbers, cut half lengthwise and removed the membrane then cut thinly. Place cucumbers in basin and marinade with salt for at least 30 minutes. After 30 minutes squeeze dry, do not wash, and toss it in sugar. Leave in for a further 20 minutes. Transfer the cucumber in a muslin cloth and squeeze to extract the excess water. Place in colander to drain really dry for at least an hour until they are almost dry to touch. Peel and wash the carrots, cut them into match sticks (thick), set aside to dry. Cut and wash cauliflower (florets) and the cabbage into 1/2 inches width and length. Set aside to dry. Bring the blanching ingredients to a boil and blanch the cauliflowers, carrots and cabbage for 30 secs. Remove and drain really dry. Blend the sauce ingredients individually starting with the hard one first. Heat oil and fry the blended ingredients, turmeric, belacan paste, curry paste and chilli paste until the oil floats up. Then add the sugar, vinegar and salt to taste. Let the sauce cool down about 2 hours. Transfer sauce into a big bowl. Place the carrot, cucumber, cabbage, and cauliflower into the sauce and toss to really mix well. Serve cold with plain rice or coconut rice with deep-fried anchovies and battered prawns or fried black pepper calamari. Note: Separate them into smaller plastic/ freezer container to store them in freezer for 4-8 weeks or glass bowl in the fridge 2 -6 weeks provided no water drips inside and always use clean dry spoon. If you can not take too hot omit the chilli paste with soya bean oil (hot) or use less fresh chilli or omit dried chilli. Prefer one day old Achar to add with risonni. 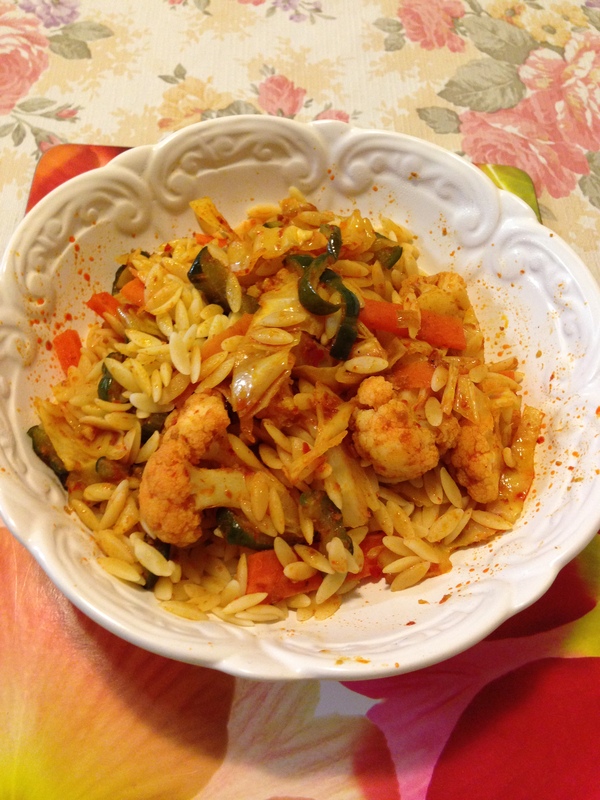 Cooked risonni as packet instruction then plate in with warm achar; toss in with risonni.